A rich flavored soup prepared with small pieces of clam, bits of vegetables, and cooked in a stock that may be cream-based or water-based. Additional ingredients may include onions, potatoes, celery, tomatoes, herbs, pork, and spices that are combined and cooked with the soup stock. Clam Chowder is a New England specialty, but it is popular throughout the world. Many different varieties of clams can be used for this type of Chowder with the smaller more tender clams the most desirable. 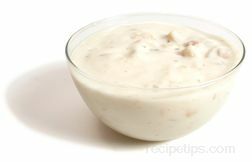 The two most common Clam Chowders commercially produced are New England Clam Chowder and Manhattan Clam Chowder, which differ by the ingredients chosen for making each type. However, there are other types of Chowders made such as Rhode Island Clam Chowder or regional Chowders made in cities such as New York and San Francisco. Although it is not considered to be a Chowder, Cioppino Stew is a popular seafood dish made in San Francisco. Cioppino Stew can be made similar to a Chowder, but is basically a seafood stew. 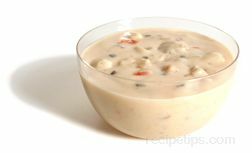 New England Clam Chowder is a creamy-textured Chowder that is pale white in color. This Chowder typically consists of a milk or cream base with bits of clam, vegetables such as potatoes, celery, and onions, combined with herbs and possibly a few spices. Manhattan Clam Chowder has a liquid broth consistency and is pale amber in appearance with the colors of the ingredients displayed within the base stock. Manhattan Clam Chowder most often consists of a water base with some milk or cream added to various vegetables that always include tomatoes, and several types of herbs combined with a few spices. 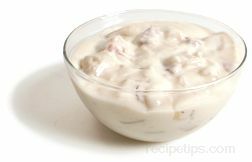 In both types of Chowder, it is not uncommon for some recipes to include a small amount of sherry and possibly some clam juice as an added clam flavoring.